Some books are available for free in PDF format. 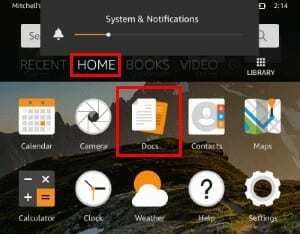 If you have a PDF file that you wish to read on your Amazon Kindle Fire, there are two ways you can transfer them over. Unlock the screen and the Kindle Fire should mount to the computer. A drive called “KINDLE” or “Fire” should now be available on your computer. Windows users can check under “Computer“. Mac users can check on the “Finder“. 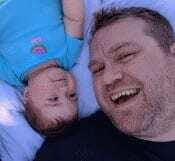 Linux users shouldn’t need to ask. 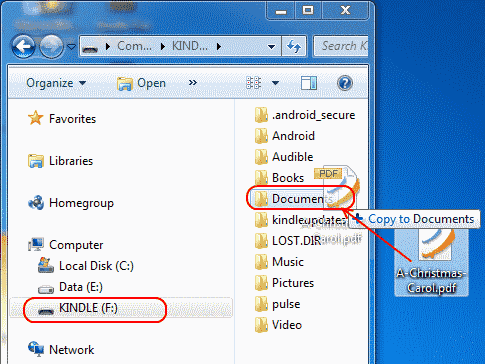 Open the “KINDLE” drive and drag your PDF files to the “Documents” folder. Once you’re done transferring files, tap “Disconnect” on the screen. Select “Docs” from the home page. The PDF file is now available. Tap it to open the file and read it. Access the email account you used to register your Kindle Fire. 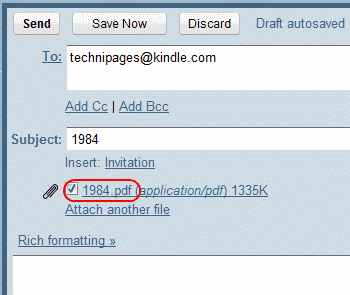 Send an email to your kindle address with the PDF file as an attachment. You can locate your kindle email address by visiting the Settings page for Manage Your Content and Devices. Wait for about 5 minutes for the device to sync. Tap “Docs” on the home screen. The PDF file you sent should appear in the list. If not, try step 2 again after 5 more minutes and try again. You’ve successfully learned the 2 ways to transfer a PDF file to your Kindle Fire. Happy reading! 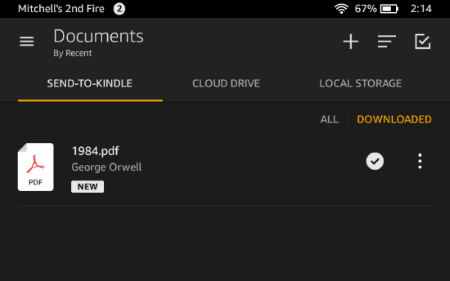 The PDF file is on my Kindle Fire, why is not showing up under “Docs”? Be absolutely sure the file has “.pdf” as an extension and is placed in the “documents” folder on the device. You will not be able to see it otherwise. I can see the file, it doesn’t open and I receive an error. Why does this happen? The PDF may be protected with encryption or DRM. These cannot be read under Docs, but you may be able to use a third-party app to read it. This tutorial was built off the Kindle Fire HD8 version, but should apply to any version. Yes, James from April of 2018, my husband and I have the same issue! Anny ideas out there as to how to reformat so we xan see an entire page at a time rather an a screen of thumbnails? Hi, is there any way to organise PDFs into subfolders? I tried , managed to find the pd f hiding in documents but still can’t open them. Tried downloading a pd f reader, still no luck , as I travel a lot i have previously downloaded knitting patterns on my old Hudl with no problems , this tablet is driving me crazy. No help with my issue. I can find and open the pd f menu, but all I get is the little pages, 12 to a screen, which are unreadable. When I try to click on a specific page, it will not open further, so I cannot actually read any type of pdf file. This is why a person should not buy a Kindle. It should be a simple tap to download a book that is not purchased through Amazon. Thank you, it worked! I can read my books now. No help. I have my own PDF. Could not find away to import or any other way to open one.